Kate Sigel had a big hit on her hand when she made a cake for the Feb. 9 dedication of the new Rush Family Birth Center. 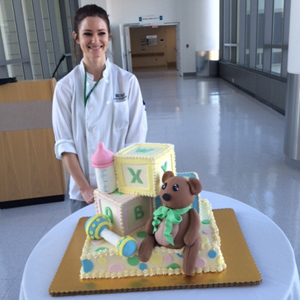 The 50-pound confection featured alphabet blocks, a teddy bear, baby rattle and bottle – all of them edible. A baker in the Department of Food and Nutrition Services, Sigel has been working at Rush since last May. She talked about making the Family Birth Center cake, how she makes a contribution at Rush, and the joy of baking. The cake is adorable. How did you come up with the design? They had an idea of what they wanted. They sent a couple of pictures and said “we want a cake with alphabet blocks, and we want pastel colors.” I took the idea they provided and ran with it by adding the rattle and the bottle and the bear. I thought it would fun. There’s always a whimsy to pastry and cakes. What ingredients did you use for it all? The base cake and building blocks were all cake and frosting. The bear and bottle and baby rattle were Rice Krispies treats covered in frosting and fondant, which is like a sugar paste. It gives you a really smooth finish, and you can model it. What other sorts of baking do you do at Rush? I do the cakes and other catering orders, more the decorated stuff. I bake for Room 500 (Rush’s dining hall), which has more plated-type desserts. I also do the iced cookies and other desserts that go up to the cafeteria. The gift baskets and bake sale stuff, a lot of that is from me. How’d you get your start as a baker? I’ve always been creative and liked to make things. I went to college for interior design, but I realized I wasn’t passionate about it. I wanted to pursue something I was passionate about. I’ve been working as a restaurant server since I was 15. The environment was familiar to me, I liked the pace and being on my feet, and I liked having something tangible at the end of the day. So I went to the French Pastry School (in downtown Chicago). How did you wind up coming to work at Rush? You obviously enjoy your work. What do you like about it? It’s a really cool combination of things I like. I’ve always gotten a lot of satisfaction out of creating. I always drew a lot as a kid. It’s something tangible that I made. There’s a little piece of me in everything I make. It’s cool to have a creative outlet. We made a wedding cake for a woman whose dad was a patient and was going to pass away. It’s amazing to be part of that. It’s a kind of opportunity that’s unique to working at Rush. A lot of time, people are at the hospital for something that’s not pleasant. It’s nice to know you’re sending something up to a patient that might make them smile, or if you’re making something that a family member or friend is having during their visit and it helped brighten their day. This entry was posted in Children, Food and Nutrition. Bookmark the permalink.